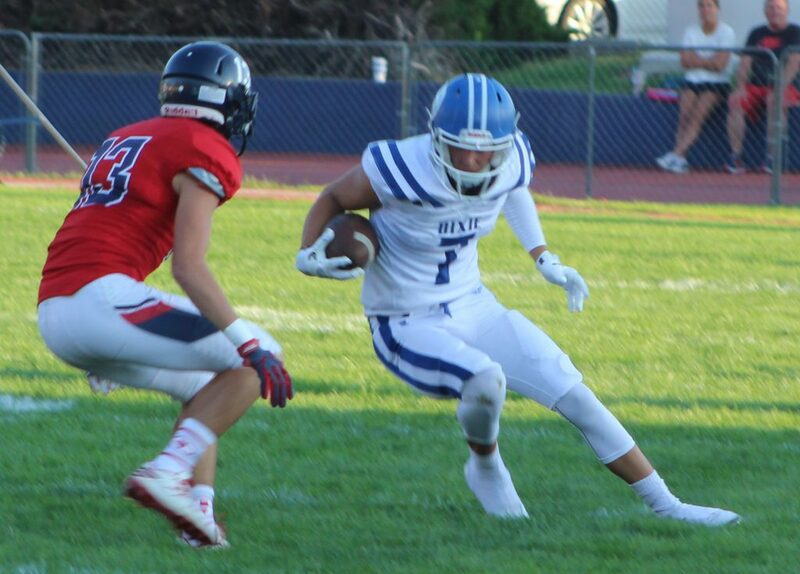 SPRINGVILLE – If there was any doubt about Jacob Barben being ready for the 2017 season after his season-ending foot injury last year, it seems fair to say those can be put to rest. 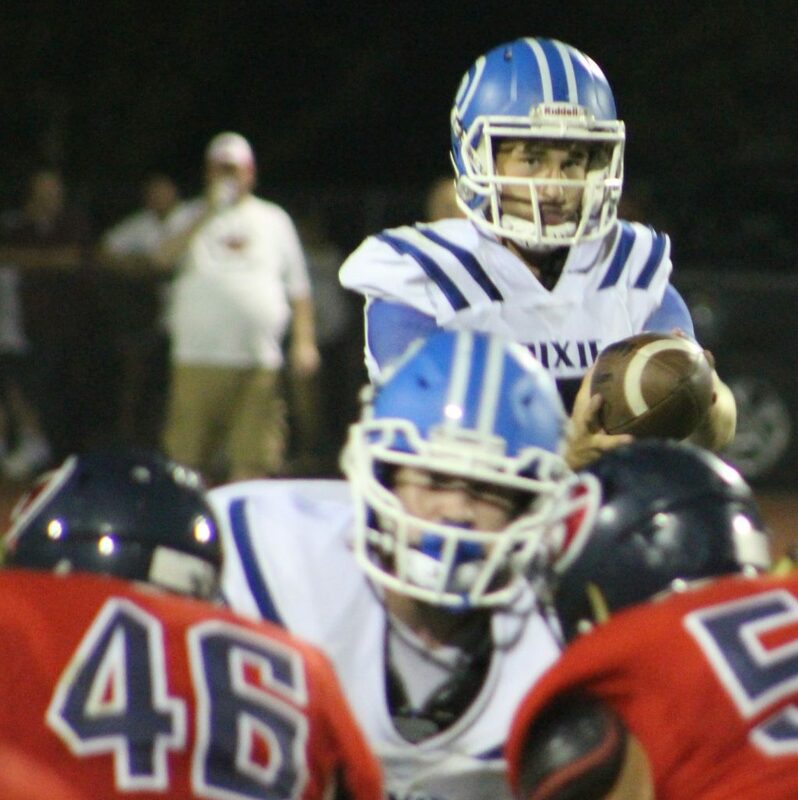 Barben torched 5A Springville for 333 yards on 22 of 36 passing and two touchdowns as the Dixie Flyers beat the Red Devils for the first time in five years, 35-34, Friday at Springville High School. 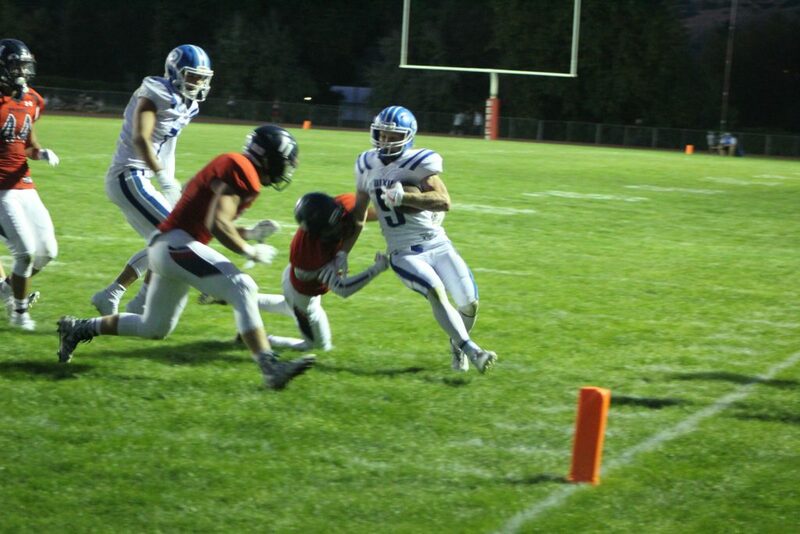 Barben took advantage of stud receivers Hobbs Nyberg (123 yards receiving, two total TDs) and Payden Harrah (141 yards) and was complemented by feature back Ammon Ah Quin’s 71 rushing yards on 12 rushes. Barben and the Flyers were the last man left standing in a wild shootout that included long touchdown passes, nifty QB scrambles, a blocked punt and TD recovery and an extremely important missed PAT. 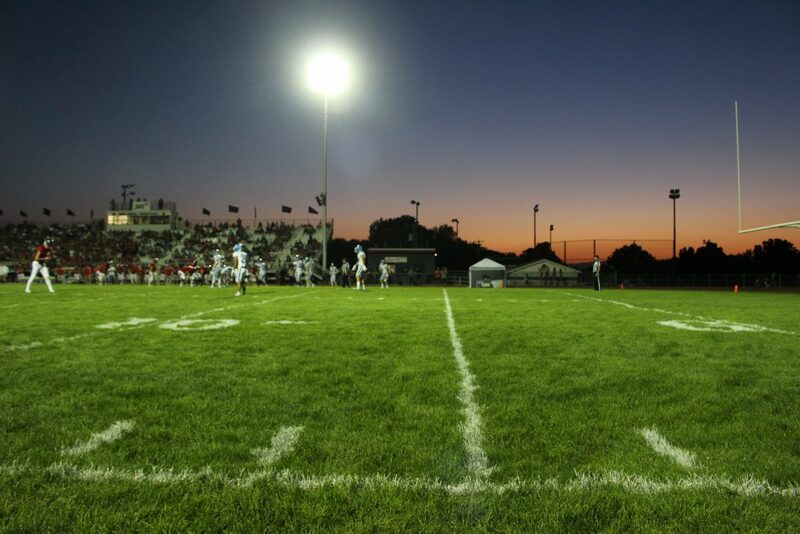 Aside from turnovers, it seemed neither offense could be stopped Friday night. To open the game, it barely took Springville a minute (actually, 1:14, to be exact) to get on the board first as QB Ty Ericksson connected with Bradley Nichols on a 36-yard TD pass that made it 6-0. 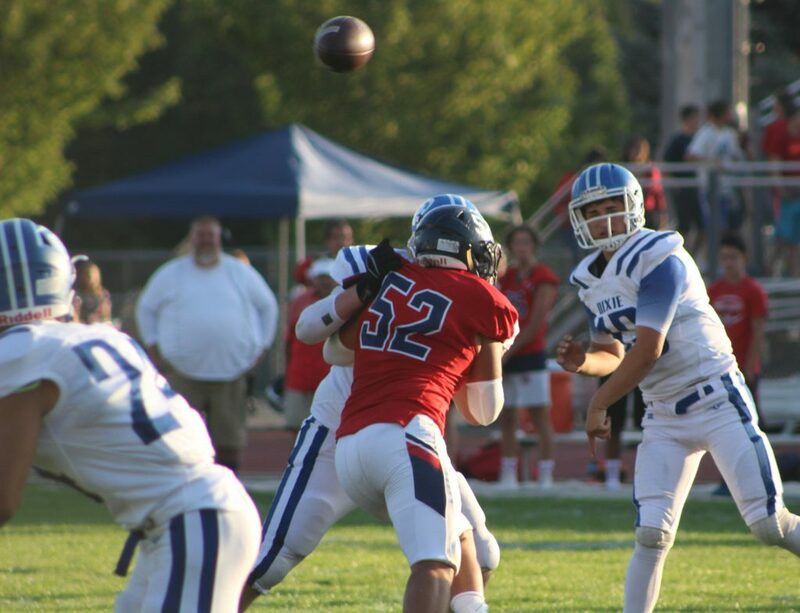 Dixie lost a fumble, but on its ensuing drive answered with Barben finding Harrah downfield to set up Ammon Ah Quin for a 14-yard rushing touchdown. That made it a 7-6 Dixie lead. Ericksson next led Springville downfield and set up Sione Kolomalu for a 19-yard TD run (with a two-point conversion pass good) and the Red Devils had a 14-7 lead. Dixie again drove the length of the field and Barben connected with Nate Mahi on a beautifully executed middle screen for a 30-yard touchdown that tied the game. Dixie’s next possession resulted in a fumble as the Flyers neared the Red Devil 20-yard line. Dixie got a stop, though, and Dixie’s special teams came up big with a blocked punt by Tyson Fisher and recovery by Conner Waldon, who carried it 7 yards for a touchdown early in the second quarter to put DHS up 21-14. With just 31.7 left in the first half, Springville’s Cole Bowers tied the game at 21-21 with a 5-yard touchdown scamper. Unrequited, Dixie drove over 80 yards in the final 31.7 of the first half, scoring when Barben found Nyberg on a quick skinny post that Nyberg made magical with some fancy broken tackles and a nifty juke move or two to take a 28-21 halftime advantage. Stokes was stoked about the play of his senior receiver, Nyberg. Dixie rode momentum and drove right down the field and scored on a long touchdown drive coming out of the half. Nyberg again found the end zone, this time, on a 1-yard touchdown run. Springville responded with a long drive of its own. Ericksson found Bowers on a flat for an 11-yard touchdown run. For most of the fourth quarter, both defenses tightened up, forcing two Dixie punts and a Springville punt and turnover. In the final two minutes, Springville finally found pay dirt when Ericksson was flushed out of the pocket by blitzing backers and scrambled for a 35-yard touchdown run. Unfortunately for the Red Devils, inconsistent special-team play resulted in a missed PAT attempt (wide left), leaving the Red Devils shortchanged at 35-34. 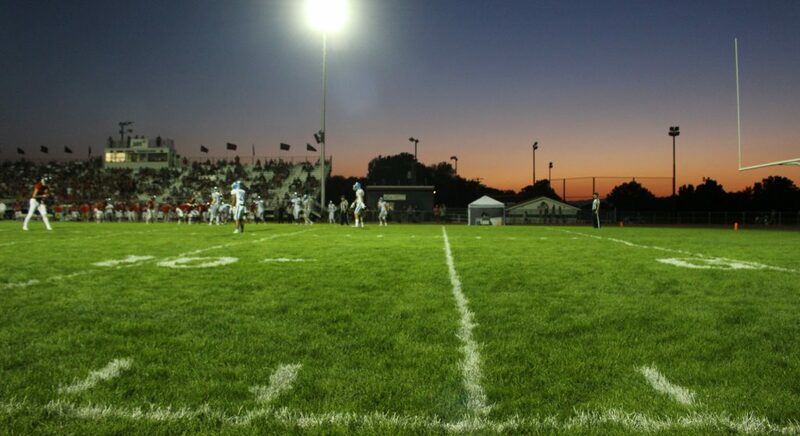 The Red Devils nearly forced a punt the ensuing drive, but were unable to contain Nyberg, who squirted free on third-and-10, after the Red Devils had expended their timeouts. Barben found Nyberg in single coverage and tossed up a floater over the corner that Nyberg secured for a 17-yard gain to seal the win for Dixie. Nyberg said it was a fortunate play for his team. The Flyers ran out the clock to take home a 35-34 win over Springville. The Flyers start off their 2017 campaign 1-0, and will host 6A Lone Peak next Friday. Springville drops to 0-1 and looks to regroup against Spanish Fork.